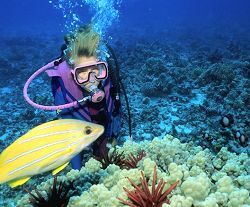 A diver's paradise, some say Papua New Guinea has more fish per cubic inch than anywhere else in the world. On land, wildlife lovers can also enjoy seeing tree kangaroos, flying foxes, and amazing array of exotic birds, and the largest butterflies in the world. 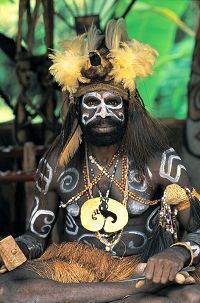 The people of Papua New Guinea are equally colorful and adorn themselves with items including jewelry of all kinds, paint, mud, feathers, vegetation, and animal furs, or horns. Don't worry about your mismatched outfits, there are n o fashion faux pas on this island. There are however, safety issues to consider due to some political hot spots. Road travel at night is to be avoided, but that is not usually a problem since most travel is done on water or in air due to the mountainous terrain of the country. You can protect yourself by taking an organized tour such as the 10 day island tour through the Melanesian Tourist Services, www.meltours.c om , or contact Trans Nuigini Tours located in Los Angeles (800/521-7242 or 323/256-1991. For accomodations, the Maolo Plantation Lodge is recommending for diving. Two clean modern hotels are located near the airport area in Port Moresby: Ai rways Hotel or Gateway Hotel. If you do plan to travel on your own, do the research on the safety concerns and stay out of dangerous areas. Papau New Guinea is a real adventure, but you'll still want to return home safely. Diving in PNG offers everything, from Pygmy Seahorses, sharks, and occasional Orca’s. The rest of the country offers dense virgin rain forests along with exotic birds and plant life. Experience rich tribal culture as seen in the everyday lives of the Huli wigman at Tari or take a cruise along the Sepik River, and the list goes on. Papua New Guinea lies just south of the equator, approximately 150 kilometres north of Australia. The climate is generally warm with a 'wet' and 'dry' season, the timings of which vary from one part of the country to another. The wettest months for most regions are November to March but rain falls mainly in the evenings and rarely disrupts daily activities. Temperatures around the coastal areas are reasonably stable and vary between 25 and 30 degrees Celsius. The Highlands are cooler and temperatures can fall dramatically at night.